King: Will Obama have health plan to deliver Wednesday? Will Senate Finance Committee have health care plan ready for him by then? 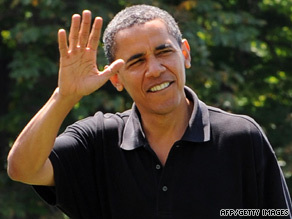 President Obama is back from his overseas trip and will hold a prime-time news conference on Wednesday. (CNN) -- For lovers of space and nostalgia, Monday could well be the week's highlight. But if political Washington had to pick one day this week, it would circle Wednesday to check for evidence of whether the fall will bring President Obama success on his signature domestic initiative. That initiative is health care, of course. And when he begins his prime time news conference, Obama hopes to deliver an opening statement congratulating the Senate Finance Committee. He hopes to laud them for embracing legislation that puts a critical collection of lawmakers on record with a proposed solution to the biggest dilemma in the health reform debate: how to pay for it. "This is the legislative process, and this is what normally happens," Budget Director Peter Orszag said on "State of the Union" Sunday. He shrugged off the suggestion that Democratic infighting over how to pay for health care reform threatened to undermine the effort to pass sweeping changes this year. "I think we are making good progress," Orszag said. Wednesday is the proof-is-in-the-pudding-day for that latter part. The Senate Democratic leadership and the White House are putting heavy pressure on the Finance Committee to adopt its health care plan before the president speaks to the nation. If he can't celebrate another step forward, the tone of the debate will be decidedly different from talk of progress. Another blunt reminder came Sunday that the White House opposes the financing mechanism favored by the Finance Committee chairman, Sen. Max Baucus of Montana: ending the "exclusion" so that some health care benefits Americans receive from their employers can be taxed to pay to cover those who lack insurance. No thanks, and find another way was the message of Health and Human Services Secretary Kathleen Sebelius. On NBC's "Meet the Press," she stuck to the administration's script that 180 million Americans get their health care as a benefit at work, and "a tax on those benefits may dismantle that market and then have people lose their coverage." One guaranteed question Wednesday is calendar driven: Will the president give ground, as his top aides have, and recast the early August congressional recess break as a goal for getting the full House and Senate to pass separate health care bills? Until recent days, that was the president's firm deadline. And now? "It's still the goal," Orszag told us. "We think we can make that. We're working towards that." This week is critical, in part to show Democrats can resolve their internal differences on health care policy and financing options -- and in part to take some steam out of the louder and louder GOP argument that public support for the Obama approach is in decline. "This is the same kind of rush and spend strategy we saw on the stimulus bill," is how Senate GOP Leader Mitch McConnell framed it on NBC. • Monday's White House event marking the 40th anniversary of the first landing on the moon. Obama will play host to the crew of the Apollo 11. On "Fox News Sunday," astronaut Buzz Aldrin called those stops critical to giving the U.S. an edge in the Cold War, and so much more. "The most critical door opening for exploration in all of humanity," is how Aldrin sees the mission's legacy. • Tuesday's Senate Judiciary Committee consideration of the Sonia Sotomayor Supreme Court nomination. Chairman Pat Leahy wanted a vote; but ranking Republican Jeff Sessions confirmed on "State of the Union" that the GOP would exercise its right to ask follow up questions and push the committee tally a week -- to July 28. • Fed Chairman Ben Bernanke's semi-annual testimony on monetary policy. The current recession is the longest since the Great Depression. (Eighteen months now; 43 months then.) Bernanke's take on when the economy will be back in the growth column, and any remarks on the growing federal deficit and the cost of health care, will move both financial and political markets. • Before his news conference, Obama's meeting at the White House with Iraqi Prime Minister Nuri al-Maliki. Look for upbeat assessments of keeping the timeline to bring U.S. troops home. But also look behind the scenes at U.S. pressure for Maliki to do more to resolve tensions with Kurds and other factions with the Iraqi political system. • Presidential road show. In northern Ohio on Thursday, Obama will look to carry over the health care message of his Wednesday night news conference. Thursday includes a stop in Chicago, Illinois, focused on what Obama does better than anyone else in politics at the moment: raising money. The Democratic National Committee is the beneficiary. • Goodbye, Walter Cronkite. A private funeral for the legendary CBS anchor Walter Cronkite, who died last Friday at 92, will be Thursday.